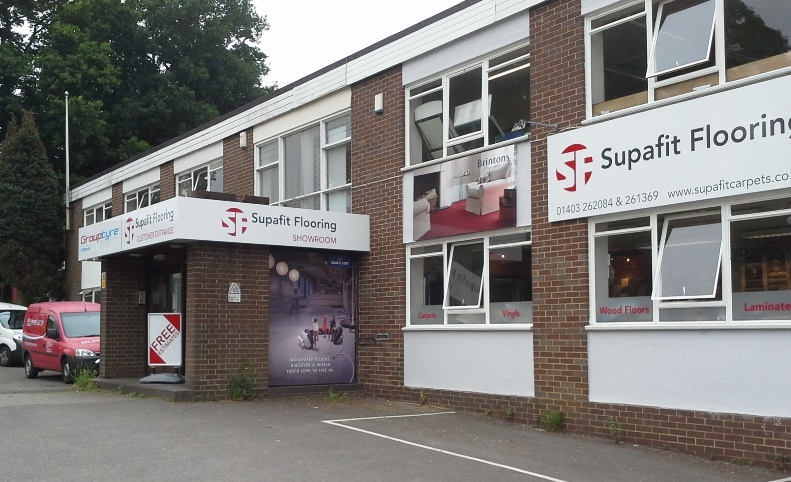 Supafit are one of Horsham’s leading and longest established carpet and flooring companies and when they wanted to update their corporate image…turned to BEL Signs for help. After meeting the owners and discussing their needs, we designed a new logo, following the brief that it should work across a multitude of applications such as signage, vehicles, clothing and stationery. External Signage – Attracting passing trade is an excellent way of getting more customers and having eye-catching external signage will ensure any business gets noticed. 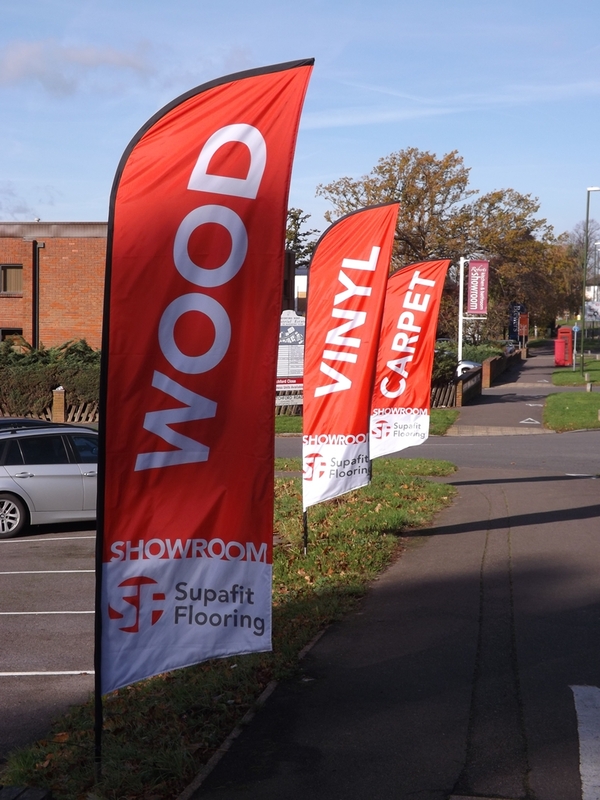 The Supafit showroom is in a prominent position on Redkiln Way, meaning any sign work would be visible from the road and instantly promote the business location to anyone passing by. Flags – In addition to the external signage, BEL Signs supplied a set of 3 flags to reinforce the brand and promote the core areas of the business. These are outside the building and have proved to be hugely successful in highlighting the businesses location and the services it provides. Work Apparel – Staff in uniforms or branded work wear convey a more professional appearance and reinforce a company’s commitment to service. Appliedfx is the in-house clothing company at BEL Signs and provided Supafit with a range of embroidered shirts, sweatshirts and polo shirts, all with the new logo on. They not only look great but are also practical and cost effective. Visit www.appliedfx.co.uk here. Printing – You only get one chance to make a good first impression and the quality of a company’s business cards often says it all. At BEL we supplied all the team at Supafit with high quality 400gsm matt laminated business cards, all with their new logo and corporate brand. In addition to this we designed and printed postcard sized flyers to promote the business when the fitters are out and about. Window graphics – With many windows, the Supafit showroom was a prime example of how window graphics can not only transform a premises visually but also be a great opportunity to further promote the core services the business provides. BEL Signs design, print and install a huge range of graphics and window effects for all uses. Banner – To complete the branded marketing to the Supafit showroom we designed, produced and installed a vertical banner to the building exterior. These type of signs are extremely popular on tall buildings and town centre shops as an addition to their conventional fascia signs need.